I believe that this passenger, Sir John Hall, was the 12th Prime Minister of New Zealand (1879). Sir John was born in 1824 in Kingston upon Hull, England. After reading a book on sheep farming, Hall emigrated to New Zealand at the age of 27. I have just had a long and interesting chat with Sir John Hall, who is looking remarkably well, and who is flying about England with undiminished vigour. Sir John was at Bristol recently, attending the Church Congress. Subsequently he went to Liverpool to hear Mr. Chamberlain’s great speech. “He is the best speaker I have ever heard,” remarked Sir John. “I do not mean to say he indulges in mere eloquence, but he devotes himself thoroughly to the work of convincing his hearers, and never seems at a loss for the right word, nor does he ever use a word more than is necessary for his purpose. 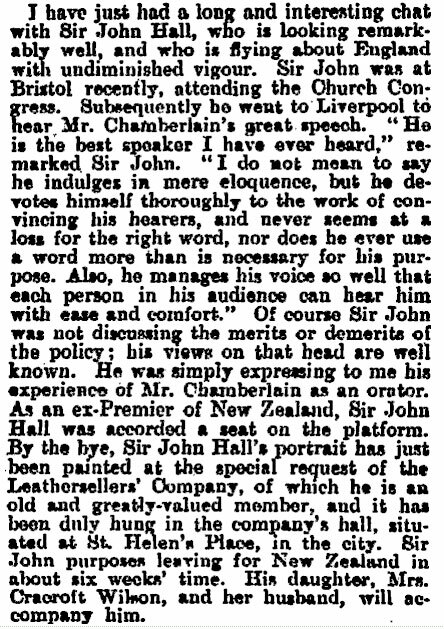 Also, he manages his voice so well that each person in his audience can hear him with ease and comfort.” Of course Sir John was not discussing the merits or demerits of the policy; his views on that head are well known. He was simply expressing to me his experience of Mr. Chamberlain as an orator. As an ex-Premier of New Zealand, Sir John Hall was accorded a seat on the platform. By the bye, Sir John Hall’s portrait has just been painted at the special request of the Leathersellers’ Company, of which he is an old and greatly-valued member, and it has been duly hung in the company’s hall, situated at St. Helen’s Place, in the city. Sir John purposes leaving for New Zealand in about six weeks’ time. His daughter, Mrs. Cracroft Wilson, and her husband, will accompany him. 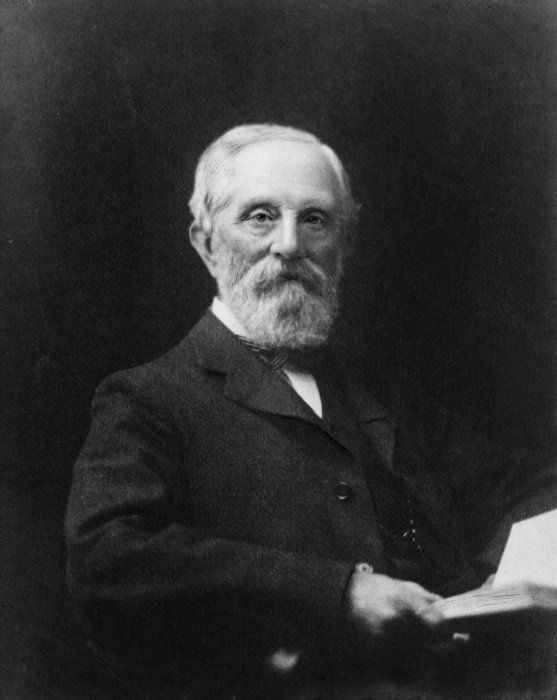 Sir John Hall died in Christchurch, New Zealand on 25th June, 1907.